TRAVERSE CITY, Mich. (AP) -- Scientists said Monday they have documented for the first time that an Asian carp species has successfully reproduced within the Great Lakes watershed, an ominous development in the struggle to slam the door on the hungry invaders that could threaten native fish. An analysis of four grass carp captured last year in Ohio's Sandusky River, a tributary of Lake Erie, found they had spent their entire lives there and were not introduced through means such as stocking, according to researchers with the U.S. Geological Survey and Bowling Green State University. Grass carp are among four species imported from Asia decades ago to control algae and unwanted plants in controlled settings such as sewage treatment lagoons. They escaped into the wild and have spread into the Mississippi and other rivers and lakes across the nation's heartland. Of greatest concern in the Great Lakes region are bighead and silver carp, prolific breeders that gobble huge amounts of plankton — tiny plants and animals that are vital to aquatic food chains. Scientists say if they gain a foothold in the lakes, they could spread widely and destabilize a fishing industry valued at $7 billion. Grass carp are less worrisome because they eat larger plants instead of plankton and don't compete with native species, although they could harm valuable wetland vegetation where some fish spawn. But because all Asian carp species require similar conditions to reproduce successfully, the Sandusky River discovery suggests it's likely that any of them could spawn there and in many other Great Lakes tributaries, said Duane Chapman, a USGS fisheries biologist and member of the research team. "It's bad news," Chapman said. "It would have been a lot easier to control these fish if they'd been limited in the number of places where they could spawn. This makes our job harder. It doesn't make it impossible, but it makes it harder." The Obama administration has spent nearly $200 million to shield the lakes, focusing primarily on an electrified barrier and other measures in Chicago-area waterways that offer a pathway from the carp-infested Mississippi River watershed to Lake Michigan. Critics say more is needed and are pressing to physically separate the two systems. The U.S. Army Corps of Engineers is scheduled to release a report in coming months on a long-term solution. John Goss, who heads the White House Council on Environmental Quality's Asian carp program, said sterile grass carp have been found in the Great Lakes for years. But the discovery that they can reproduce within the watershed "reinforces why we must continue to execute the aggressive strategy to keep silver and bighead carp out of the Great Lakes that we have been pursuing for the past three and a half years," he said. A commercial fisherman captured four small grass carp from the Sandusky River in 2012. Chapman and his colleagues determined they were at least a year old and could become spawning adults. The scientists also examined bones in the fishes' heads called "otoliths" that indicate the chemistry of the waters they've inhabited, and they compared them with otoliths of farmed fish. The analysis confirmed the grass carp were hatched through natural reproduction in the river. To spawn successfully, Asian carp need rivers of a certain length with currents that keep their eggs drifting long enough to hatch. Researchers are fine-tuning computer models that can determine the likelihood that a particular river is suitable. A few years ago, scientists believed that perhaps two dozen rivers in the Great Lakes watershed offered good spawning habitat. But the grass carp analysis and other recent findings suggest the number may be considerably higher, Chapman said. He and others are developing a list. "It also means that many more reservoirs in the United States are at risk of Asian carp establishment," he said. The Sandusky River has about 15 miles of flowing waters accessible to the grass carp — a shorter stretch than experts previously believed necessary for spawning. 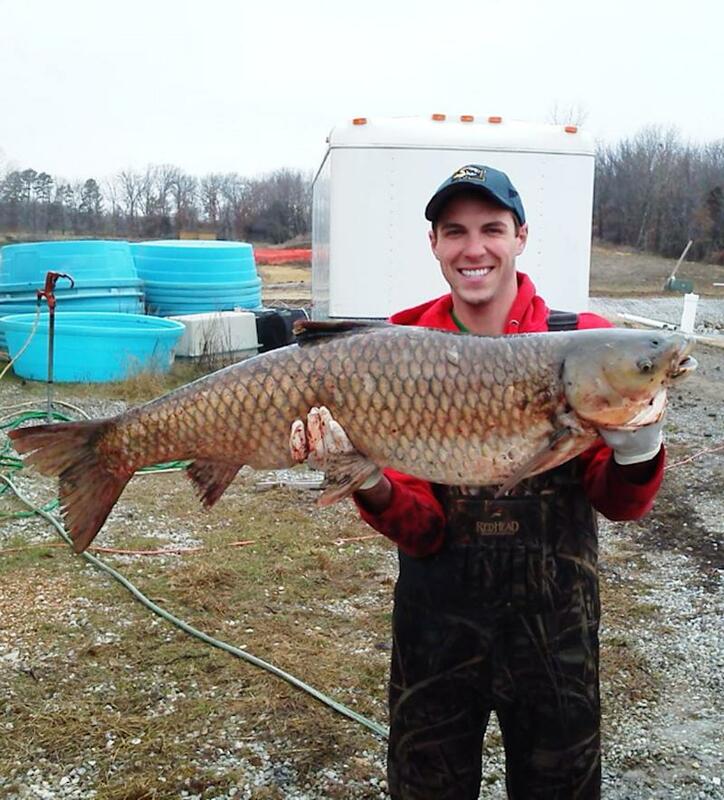 "This is further evidence that we can't underestimate the flexibility that Asian carps have to become acclimated to and even adapt to environments outside their native range," said Reuben Goforth, a Purdue University scientist who has studied the carp but wasn't involved with the USGS project.